"Akaea" (means to breathe, inhale, relax), and we hope you will do just that when you stay at ‘Akaea Villa - Rarotonga. 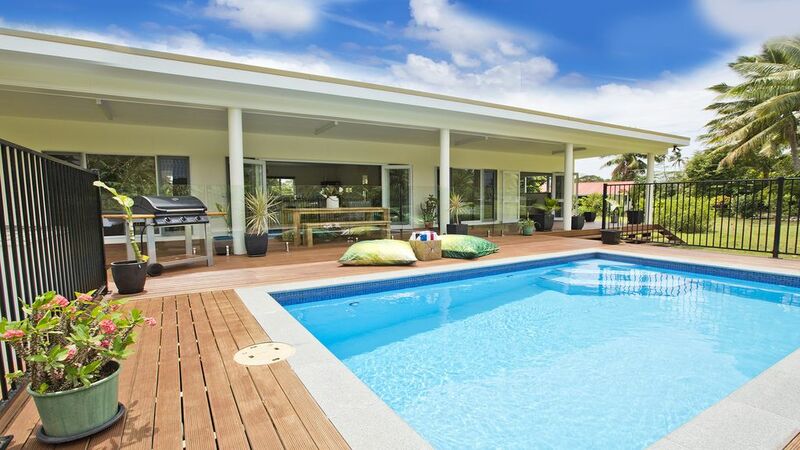 A beautiful brand new fully furnished 4 bedroom, 2 bathroom home situated on the north eastern side of Rarotonga. With a child safe and secure enclosure, the swimming pool will be perfect for families with little children. After a long hot day in the sun there is nothing better than cooling down and relaxing in your very own pool with the beautiful views of the lush mountains. Nothing beats being in the comfort of your very own large open deck, sipping a glass of bubbly - or whatever your heart desires! Complete with all the comforts of home, including Large LED TV, stainless steel oven/ stove, microwave, fridge with an ice maker, deluxe cheese grill, dishwasher, ceiling fans in all rooms, washer and dryer you would not have to leave your house except to grab a bite. The large flat yard surrounding the Villa also provides ample space for you to enjoy running around and playing to your heart s content. If you wish to stock up on supplies the nearest store Superbrown is 5 minutes away. One of the few stores that is open 24/7 on the island. Otherwise town is only a short 10 min drive away. Akaea Villa was built for people to enjoy and have lasting memories with friends and family! Just returned from holiday here, awesome house! We had 2 family's here and the layout is excellent, the pool is great for the kids! Location is good with a short walk to the main road to catch the bus. Would certainly stay here again.